As a long-time teacher, I have had the privilege of spending most of my life in the field of education. Although my original intent had been to make a career in the engineering profession, the Lord clearly lead me, several years after graduation, into the ministry of teaching, and I have been there ever since. Twenty-four years were spent teaching many different scientific subjects in secular universities, and then eight years I taught mostly Biblical subjects in a Christian college. I have also taught regular Bible classes in various churches for over 27 years, some to junior high and senior high classes, but mostly to college-adult classes. Although an intensive travel schedule in more recent years has kept me from serving as a regular Sunday School teacher in this recent period, I have had the privilege of serving as guest teacher in many scores of church and college classrooms all over the country. In addition, I have combined the teaching with educational administrative responsibilities for over 40 years. Many people, of course, have had even more experience in varied types of teaching. The above testimony is not meant to impress anyone, but express a long commitment to education and a sincere concern for its ministry to people of all ages. The many years I spent in secular teaching, at five different universities, were marked by almost continual interaction with the evolutionary humanism being promoted in these schools, not only by faculty members and textbooks in the natural sciences, but probably even more so by those in the social sciences and humanities. A similar situation prevails at practically every secular college and university in the world today. Furthermore, as I began to have more and more opportunities for contact with various Christian colleges, it became evident that most church colleges, and even the interdenominational evangelical colleges, had been infected by this same malady. Evolutionary cosmogonies and humanistic philosophies were often coated with a veneer of Biblical theology and Christian sentiment, but the inroads of such paganism were deep. Although it is important to witness personally to the students on such campuses concerning their individual need of salvation (and I have had the joy of praying with many of them and seeing many accept Christ through these years), it soon became evident that this was essentially a strategy of retreat, salvaging a few here and there in the battle, but watching ungodly teachings and practices become stronger year by year, carrying greater numbers of students every year into complete unbelief. Even the ministries of such campus Christian organizations as the Baptist Student Union, the InterVarsity Christian Fellowship, the Navigators, and Campus Crusade for Christ (and I have served actively as faculty advisor at one time or another for each of these) have been little more than voices in the wilderness. In spite of the many conversions that resulted from the work of these organizations, the number of unsaved students increased even more rapidly, and the entrenchment of evolutionary humanism seemed to become deeper and stronger as time went on. The real problem is that Christians have, for half a century (since the Scopes trial in particular), been concentrating on evangelism and "personal" Christianity, almost completely abandoning science and education to the evolutionary humanists. It is not enough merely to try to win individual students and teachers to Christ, important as that may be; we must win education to Christ! Wonderful though it is when a scientist comes to Christ, it would be still greater if we could see science turn to Christ. Even though the return of the Lord Jesus may take place at any time, He did tell His followers: "Occupy till I come" (Luke 19:13). As pointed out in some detail later on, mankind is responsible for exercising dominion over the earth, and this commandment has not in any way been withdrawn. The enterprises of science and technology, and especially of education, are man’s stewardship under God, to bring honor to Him. These commandments are more meaningful to the Christian than to the non-Christian, and he is under greater responsibility (because of greater knowledge) to see that they accomplish what God intended for them. The real world is not the world of sin and warfare, hatred and conflict, in which we live now. This present age is only a temporary intrusion in the perfect world that God created in the beginning and which He will soon reestablish to endure forever. True education, therefore, must be education that will equip people for fruitful lives in both time and eternity. The Christian school movement of recent decades has been a partial answer to the secularization of the public schools. Even Christian schools and colleges, however, have found it almost impossible to return to a truly Biblical system of education. In spite of their good intentions, the almost universal evolutionary bias in textbooks and the humanistic graduate schools where their faculty members have to obtain their training have prevented them from attaining or maintaining this standard. Neither these reasons nor any others, however, can really justify any longer the common practice in Christian schools of compromising with evolution and humanism. There has been a serious revival of scientific creationism in the past thirty years, and this development has eliminated any legitimate excuse for further compromise. Humanism and all other anti-Christian philosophies are based squarely on the assumption of evolution, and it has been clearly shown by creation scientists that special creation is a much better scientific explanation for the world than evolution. There is thus bright hope and real opportunity in the days just ahead to reestablish a system of true education, based on the Biblical doctrine of education in all it fullness. God has raised up in recent years thousands of scientists, as well as many scholars in other fields, who are committed to faith in Christ and the Scriptures, and in particular to a world view founded in Biblical creationism. Such people could, if properly informed and motivated, do the necessary research, write the necessary books, and establish the necessary schools to accomplish the great ministry of bringing education and science back to God. Or at least we ought to try! The hour is late; evolutionary humanism came full flower in communism and other anti-God systems which have deceived most of the world. If the Lord Jesus Christ does return soon, Christians will rejoice in His presence, but their joy may be muted as they contemplate the billions of young people who are not there. And the reason they will not be there is largely because Christians have allowed those schools of an earlier day, where the youth were taught to respect God and His Word, to be replaced by schools where they are taught to reject them. Until Christ does return, therefore, we must do all we can both to reclaim our public schools and, even more importantly in view of the time factor, to establish sound Christian schools where every teacher is God-called and properly prepared, and where all courses and textbooks completely conform to the principles of Scripture. Although the illustrative examples in this book (reflecting my own experience) may emphasize college education, essentially the same principles and problems apply to Christian elementary and secondary schools, and, indeed, to all aspects of the over-all ministry of true education at any level. The purpose of this book is to try to place education in its true Biblical perspective, as best we can establish that perspective through sound Biblical exegesis. 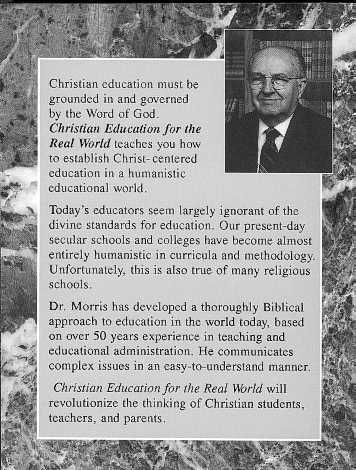 I believe it will be obvious that even our Christian educational enterprises have come far short of God’s criteria, and we all have much work to do, as God enables, in order to build a true Biblical system of education. Furthermore, it will quickly become apparent that the opposition is strong and deeply entrenched, and a great battle must be fought and won before this goal can be reached. Nevertheless, what God has commanded, He will enable to be accomplished. "For though we walk in the flesh, we do not war after the flesh: (For the weapons of our warfare are not carnal, but mighty through God to the pulling down of strong holds;) Casting down imaginations, and every high thing that exalteth itself against the knowledge of God, and bringing into captivity every thought [same in the original as ‘mind’] to the obedience of Christ" (II Corinthians 10:3-5). 1. See, for example, Scientific Creationism (ed. by Henry M. Morris, San Diego, Creation-Life Publishers, 1985, 295 pp.). This book is essentially a documented comparison of the relative effectiveness of the creation and evolution models in correlating all the scientific data relating to origins and earth history. In addition, it contains an extensive bibliography of creationist literature. A more recent book of the same type is What is Creation Science? by Henry M. Morris and Gary Parker (San Diego, Creation-Life Publishers, 1987, 352 pages.). "The principles governing true Biblical education, as outlined in this book, are not those which reign in secular education. The educational establishment in this country has become very powerful, and, unfortunately, with government backing it has largely usurped control of both educational organizations and curriculum content from parents and churches, where they belong. To a large degree, this control of curriculum has been used to further the goals of socialism, globalism, and humanism, as formulated in the Tenets of Humanism by John Dewey et al. Evolutionism has provided the pseudo-scientific rationale for all these systems and their aims." 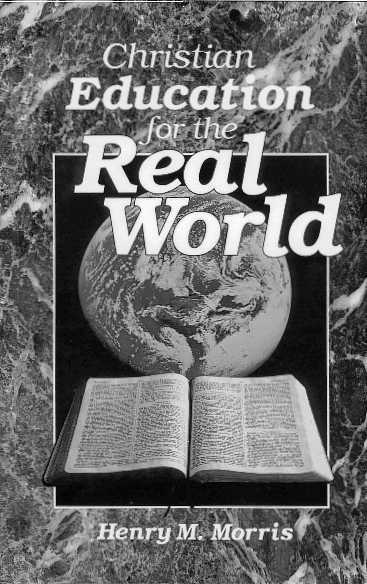 Introduction, front cover and back cover images of Christian Education for the Real World are Copyrighted © 1991 by Master Books, a division of CLP Publishers, Inc., PO Box 1606, El Cajon CA 92022, 870-438-5288. Used on CEANet with permission.